I have a Trapper Nelson #3 that my grandfather gave me (he was a prospector and spent a lot of time in the interior of BC especially around Barkerville in the 1940s). I still use it exclusively and it routinely goes about 160 kilometers (or 100 miles for you US types) each summer and always in one long trip - the Boundary trails in Jasper being my favourites or a similar trip in the Willmore north of Jasper Park. I certainly don't understand the comments about torture or antique. It is a good working pack and is not hard to carry and I am no mountain man I assure you of that! Hi Bob. Just caught your comment of May 14 but have no way of contacting you except this comment board. Re: the booklet - oddly enough, neither the Vancouver Museum (book shop), nor tourism board nor the historical society have shown any interest in my 'magnum opus' on Jones Tent and Awning, yet it was a 100 year old company that started right after the great fire. In the meantime, I came across another Trapper Nelson Indian Pack Board, but of the Pintail Brand made by a different company entirely (not Jones or Trager). I found the piece of paper I lost re: the other Trapper Nelson Pack Board. 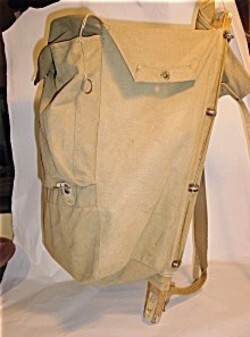 It was made by Edward Lipsett Ltd., a B.C. company that made camping equipment in the 1930s and 1940s. By 1954, that branch of the business was dropped. The Lipsett version is identical to the Jones Tent and Awning and Trager (Seattle) boards. Does anyone have a Pintail and/or know anything more about Lipsett Ltd? Bill Heywood: I would be interested in purchasing those packs from you if you still have them. I have one that I use regularly but the frame is a little broken and it's just wearing out. Does anyone know of any plans available to build a "Trapper Nelson" or perhaps a similar pack board? This is an outstanding pack, I came across one in the Seattle, Washington Goodwill Outlet store where things are bought by the pound and if the folks working there like you, you can get some insane deals. This pack with just a few minor tears that I patched and some light wear cost me $1.75. I used it a few months later for a two day hike near Bellingham, Washington. It was the highlight of conversation with the folks I came across on the trail. I ran into one old timer at the trailhead who remembered buying one of these new when he went into the Forestry Service. "It still gets the job done all these years later and after all the hell I put it through." 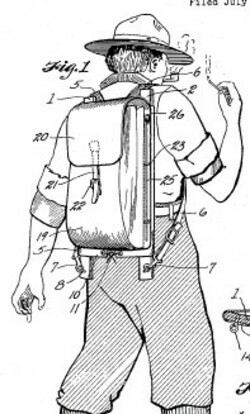 I came across one of these backpacks and wanted to know more about it. 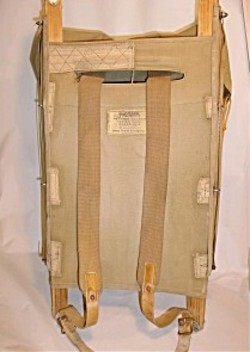 It is a Trapper Nelson Indian Pack Board manufactured by Chas. Trager. I was wondering if anyone knew the value or the age of the pack.